Me, Doc, and Giant Eyes!!! Crazy time of year. I have been trying to update everything in a timely fashion...which sometimes doesn't always happen after a long day on the water. 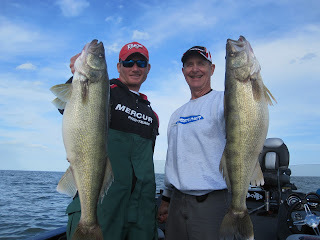 A pic of a a true double header that me and electronics guru Bruce Samson landed a few days ago. The fish will get bigger as the weather gets colder! Me and Bruce were working on a really neat project which will be released some time this spring. Stay tuned.